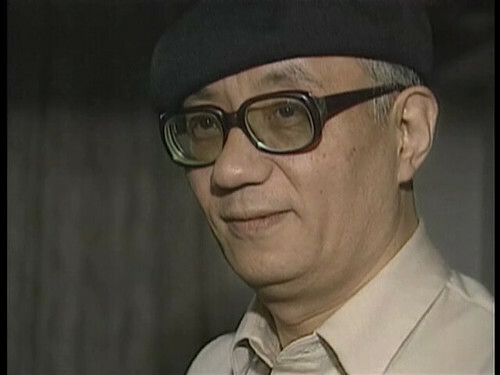 Tezuka died of stomach cancer on February 9, 1989, at the age of 60. 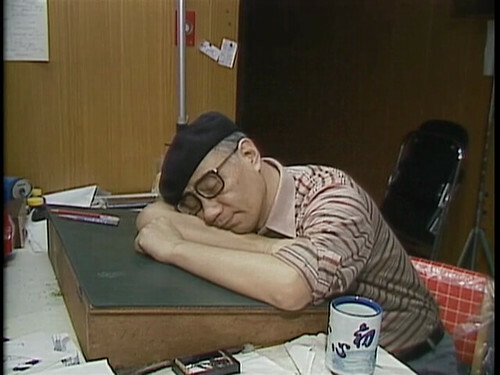 From all the available evidence, he worked himself to death, having kept up a furious pace of drawing and writing manga series for over 40 years and supervising animated productions for more than 25 years, functioning on three hours of sleep a night (and sometimes none at all!) 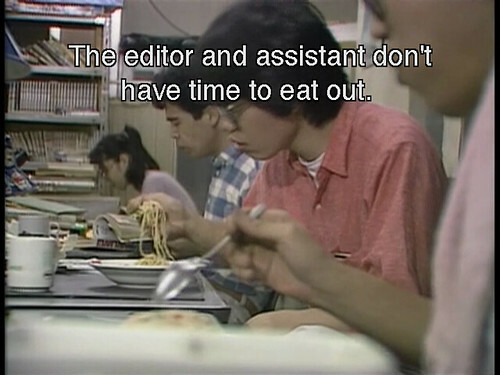 and eating take-out food for much of that time. 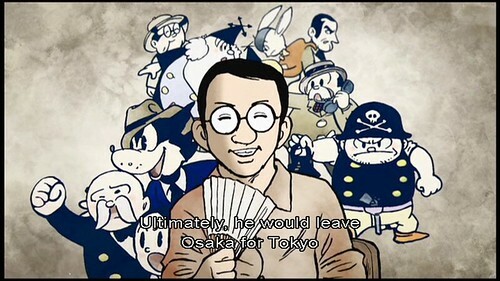 In preparation for this piece, I watched a 1986 documentary about Tezuka produced by NHK (the Japanese public broadcasting company) and read the massive opus, The Osamu Tezuka Story: A Life in Manga and Anime, a 914-page biographical manga created by Toshio Ban and Tezuka Productions and first published, as a book, in 1992 in Japan and published in English by Stone Bridge Press in 2016 with English translation by Frederik L. Schodt. 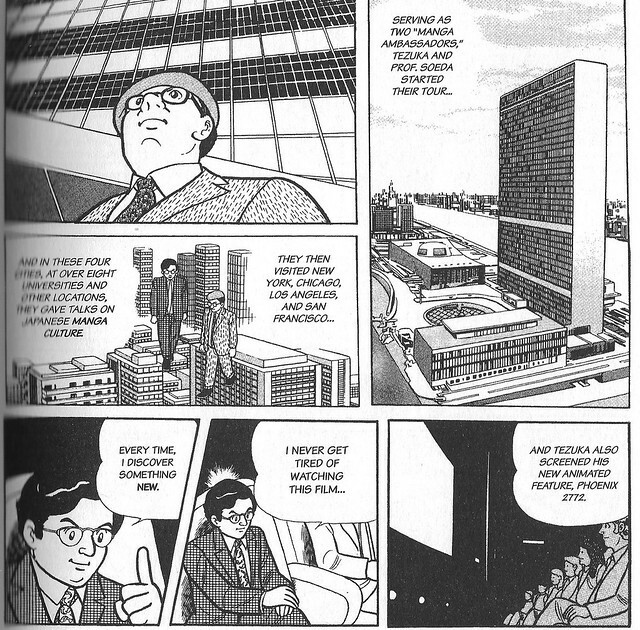 It’s even thicker than Yoshihiro Tatsumi’s 856-page autobiographical manga, A Drifting Life, which I covered here on March 23, 2015. 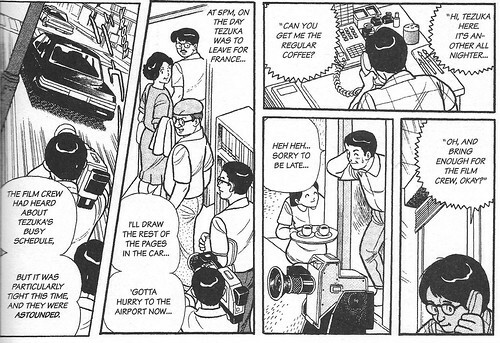 I’d always wanted to read a biography of Tezuka in English, but any that exist are only in Japanese. 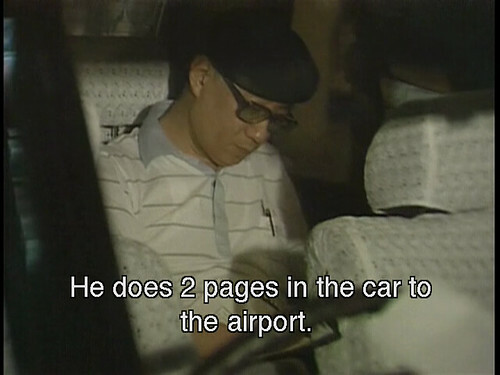 He wrote an autobiography, Boku wa Mangaka (I Am a Manga Artist), that was published in 1969, but has never been translated into English. 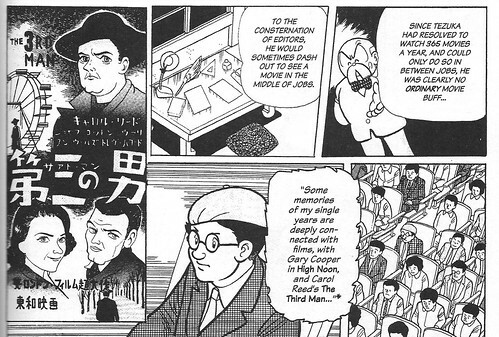 It’s referenced a lot in the manga biography and quoted from extensively, but he was active for a good 20 more years after its publication. 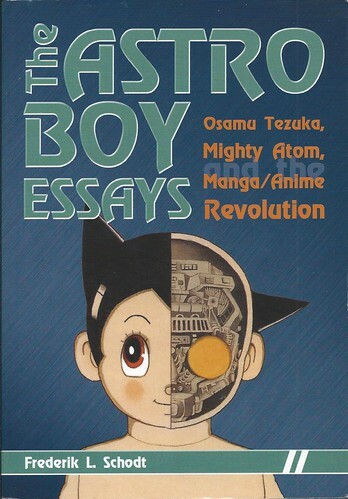 The closest thing I’d found in English before the manga bio is Frederik L. Schodt’s The Astro Boy Essays: Osamu Tezuka, Mighty Atom, Manga/Anime Revolution (Stone Bridge Press, 2007), which focuses on Tezuka’s involvement with his manga, “Tetsuwan Atom” (Mighty Atom), and its subsequent animated adaptation, shown in the U.S. as “Astro Boy.” It’s an excellent book, but I wanted more. 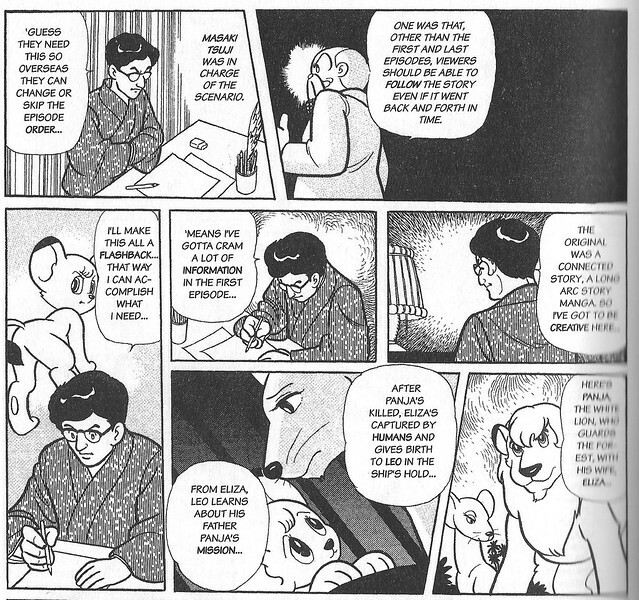 The Osamu Tezuka Story: A Life in Manga and Anime is the closest I’ll probably come in my lifetime to a full biography of Tezuka in English. 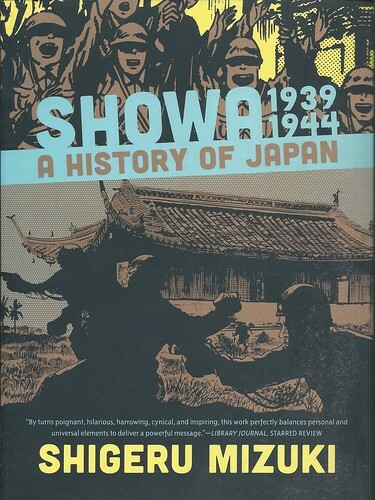 The book began as a series of weekly installments in Asahi Graph, a weekly, large-format visual news magazine published by the Asahi Shimbun Company. 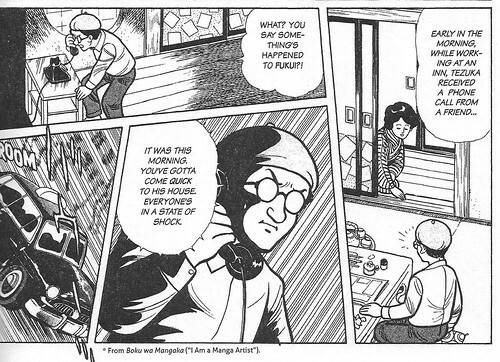 The writer/artist is Toshio Ban, who had been Tezuka’s “sub-chief” assistant. 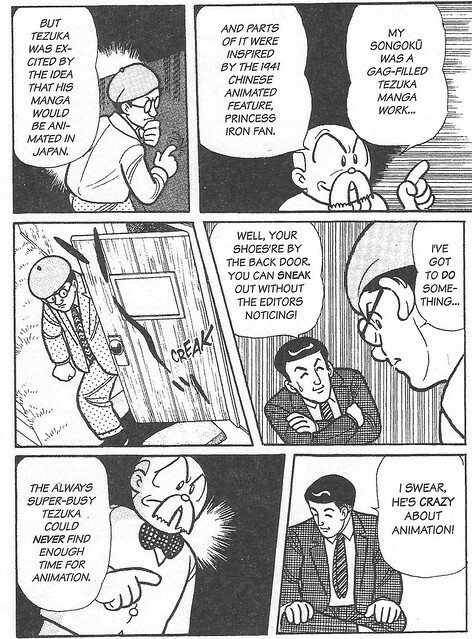 Tezuka Productions had archives and a manga staff in place, so once he’d been assigned the task, Mr. Ban could get help from other artists in rendering backgrounds and have the studio’s archivist assist with research and reference materials. 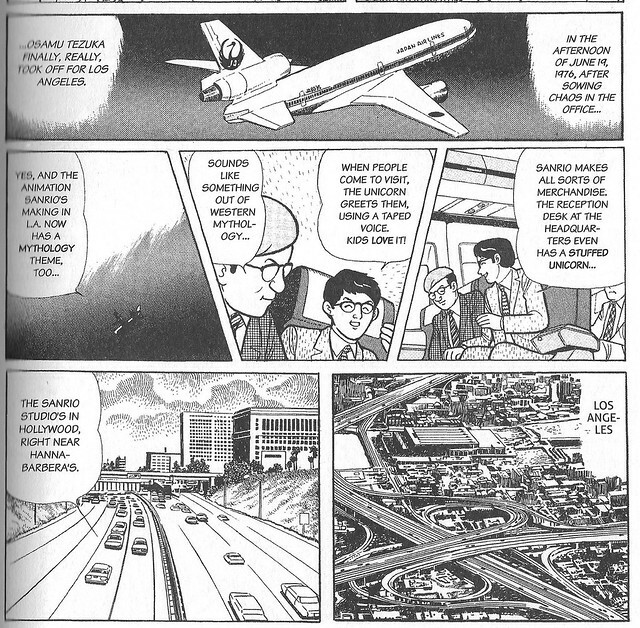 Many of the places associated with Tezuka hadn’t been demolished yet, so Ban could still do detailed drawings of them in 1989-1992. 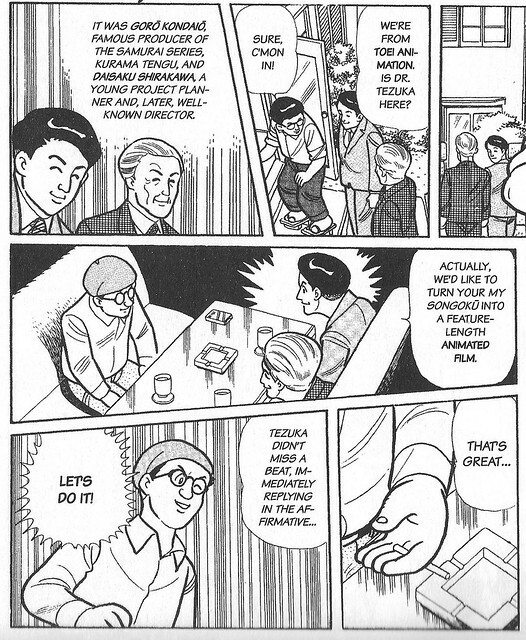 Many of Tezuka’s old friends and colleagues were still alive and available to be interviewed. 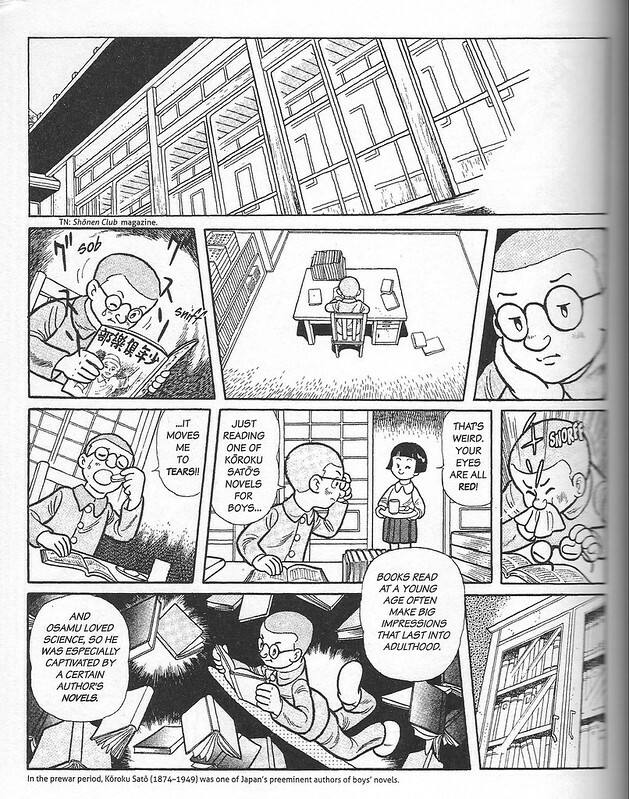 The book covers Tezuka’s whole life from his birth in Osaka and childhood in Takarazuka to his untimely death at the age of 60 in Tokyo. 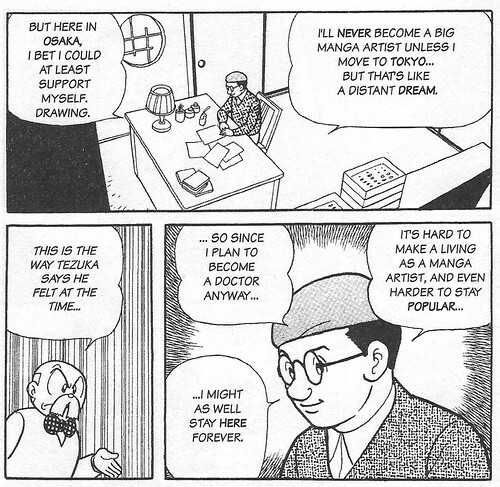 He was a teenager during the war and afterwards, but was already drawing manga and trying to succeed in the burgeoning manga business. 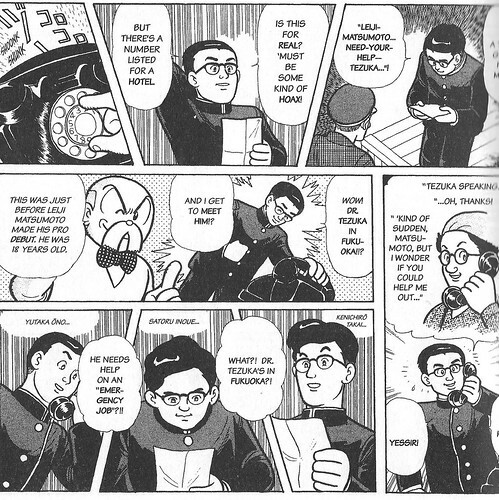 We see the effects of the war and its aftermath, including an incident where Tezuka is bullied by drunken G.I.’s during the Occupation, all of which imbued in Tezuka a deep and abiding abhorrence of war. 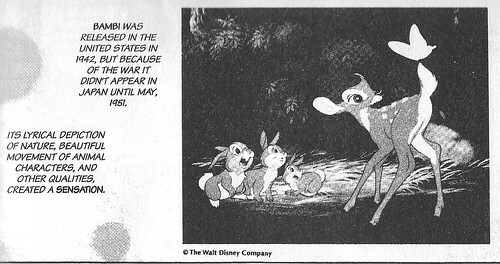 We also learn of his love for movies, including American movies, and animation, with a special regard for the productions of Walt Disney, especially BAMBI (1942), which he claimed to have seen 80 times during its theatrical run in Japan. 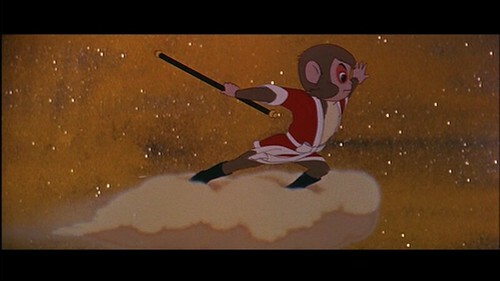 A number of classic films are cited in the biography. 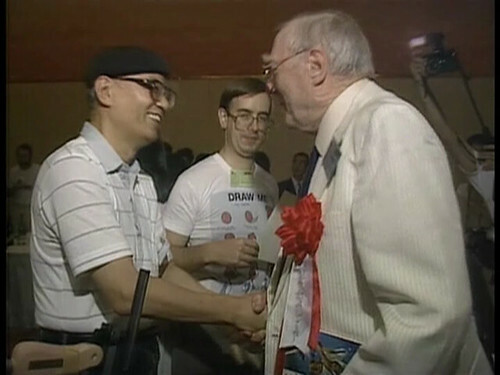 During this time, he was also going to medical school with the goal of becoming a doctor. He eventually got his degree, but never practiced. 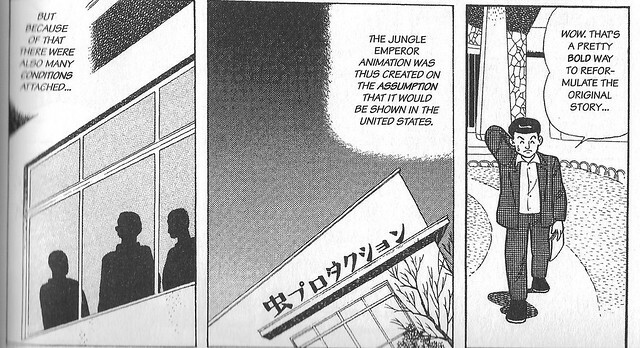 The pull of manga was too strong. 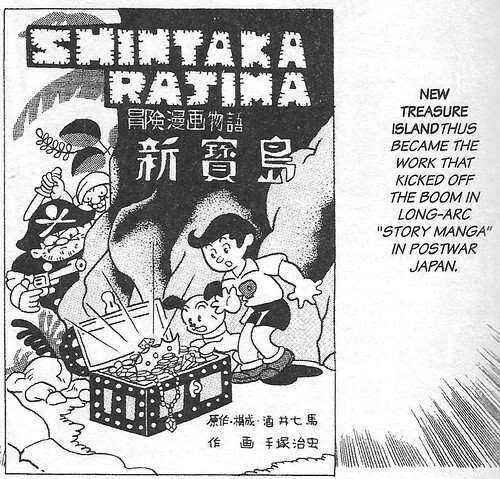 He achieved success in manga rather quickly after the war, with such titles as “New Treasure Island,” “The Mysterious Underground Men” and “Lost World,” and eventually started two long-running series in the 1950s, including “Jungle Taitei” (the eventual basis for “Kimba, the White Lion”) and “Tetsuwan Atom” (the basis for “Astro Boy”). 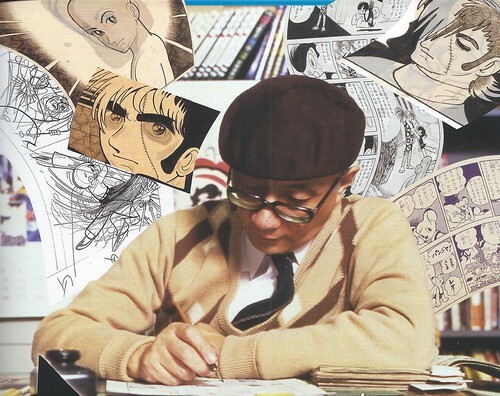 In the process, he becomes a mentor to numerous young artists and future manga stars, including Leiji Matsumoto (Galaxy Express 999), Shotaro Ishinomori (Cyborg 009), and Takao Saito (Golgo 13). 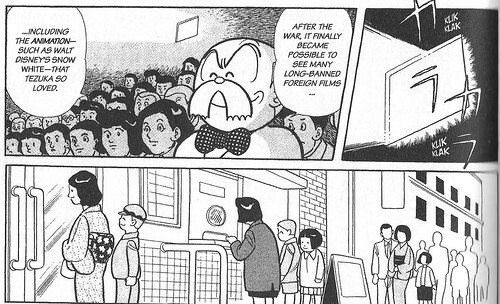 A recurring pattern emerges early in Tezuka’s career. He overextends himself and agrees to do more work for different publishers than he has the time and capability for. 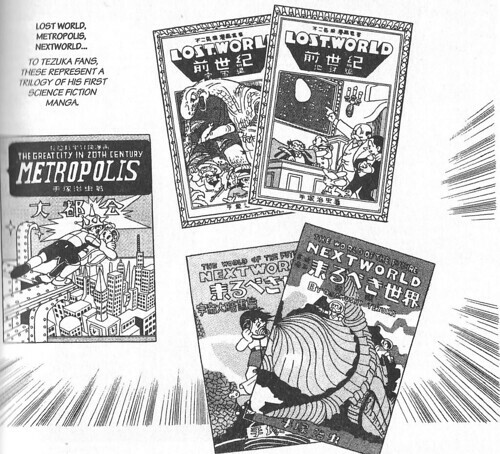 He does stories and series for both weekly and monthly manga publications, many of which achieve success because of the popularity of his manga. 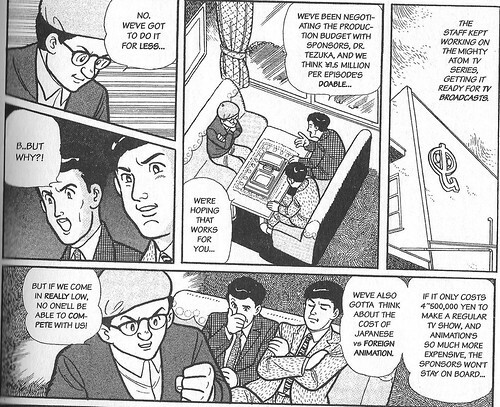 Eventually, editors start camping out in his house, each demanding he finish his work for them first. Ideas pour out of him and it’s all he can do to keep up with his own imagination, let alone the demand from publishers. 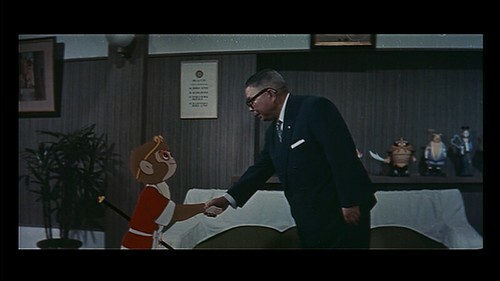 He gets a wake-up call in 1954, when his chief rival, Eiichi Fukui, dies of karoshi (overwork) at the age of 33. 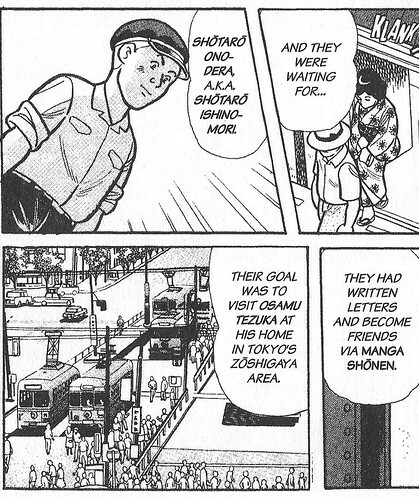 Did this slow Tezuka down? No. 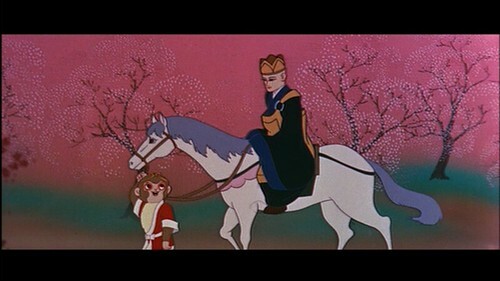 From early on, he nurses a desire to do animation and gets a call from Toei Animation in 1958 when they ask to adapt his manga about the Monkey King of Chinese legend, “My Songoku,” into a full-length color animated feature. 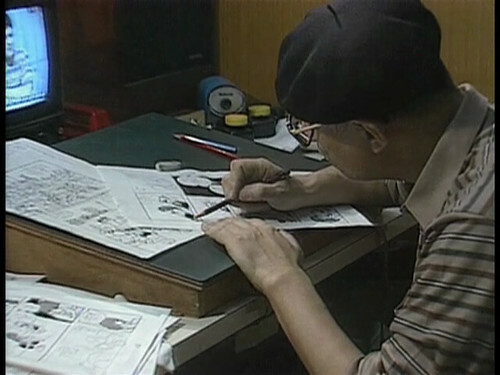 He agrees and even supervises the storyboards, using his hand-picked assistants (including Shotaro Ishinomori), and contributes to the script. 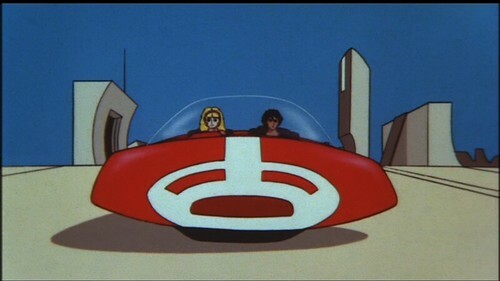 He gets co-director and co-writer credit, as well as creator credit. 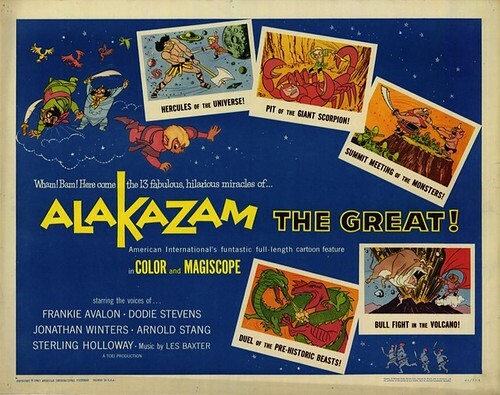 The film was eventually released in the U.S. in an English-dubbed version called ALAKAZAM THE GREAT (1961), voiced by a celebrity cast. 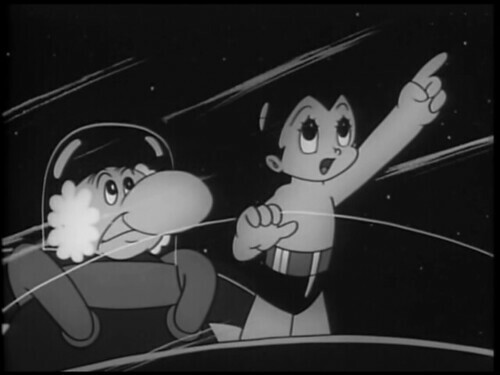 In the process, Tezuka studies the production methods of animation and resolves to produce his own, resulting in the creation of Mushi Productions and the development of Japan’s first half-hour animated TV series, “Tetsuwan Atom,” based on Tezuka’s manga, and shown in the U.S. as “Astro Boy,” the first Japanese animation to air on American television. 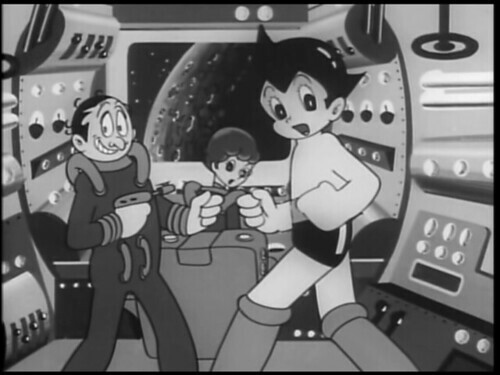 “Astro Boy” was about the turbulent life and fantastic adventures, in space and on Earth, of a robot boy created in the 21st century. It boasted exciting and imaginative stories; frequent moral and ethical dilemmas as Astro tries to negotiate relationships with humans; and impressive futuristic sci-fi background art. 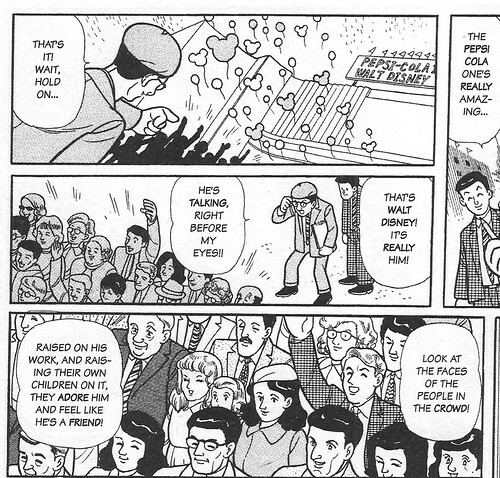 Tezuka visits the U.S. in 1963 and again in 1964, when he attends the World’s Fair in New York, where he has a brief encounter with his idol, Walt Disney, who says something nice about Astro Boy. 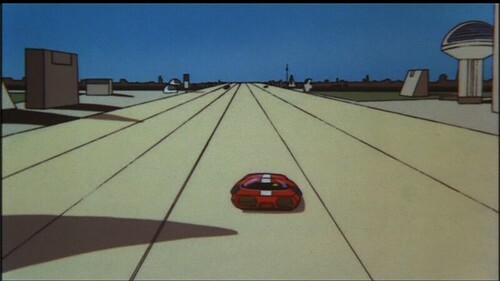 He eventually starts making more trips abroad, usually to international animation festivals, where he’s an honored guest and sometimes enters an individual work of his. 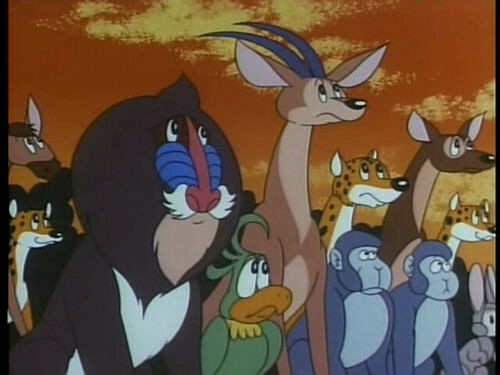 He also created Japan’s first color animated series, “Jungle Taitei” (Jungle Emperor, 1965), which was shown in the U.S. as “Kimba, the White Lion” in 1966. 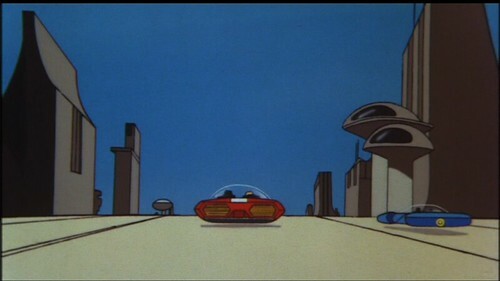 Much has been written about how the series was created, following dictates by NBC, which had purchased the rights to show it in the U.S. before it was even produced. 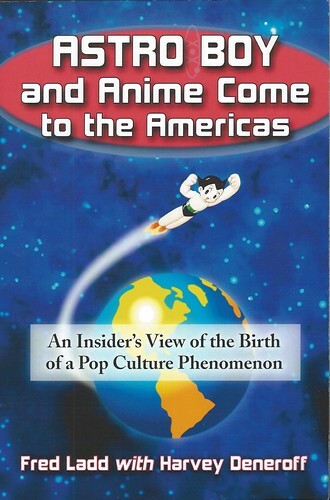 Fred Ladd, who supervised the adaptation of both “Astro Boy” and “Kimba” for American television, has written about it at length in Astro Boy and Anime Come to the Americas: An Insider’s View of the Birth of a Pop Culture Phenomenon, co-written with Harvey Deneroff. 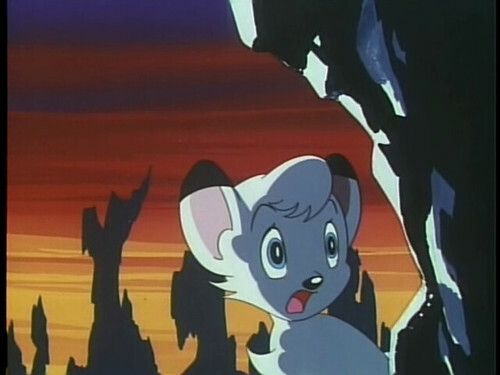 “Kimba” was the tale of a white lion cub who sought to fulfill his late father’s dream of uniting the animals in the African jungle and expand it with his own campaign to communicate and make peace with the humans. 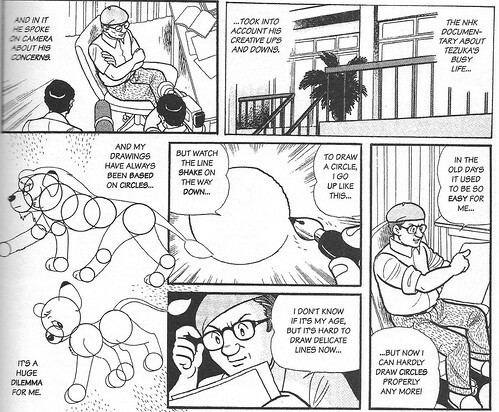 In the original manga, Leo (Tezuka’s name for the lion) started out as a cub, but grew up during the course of the series, becoming an adult and the undisputed king of the jungle. 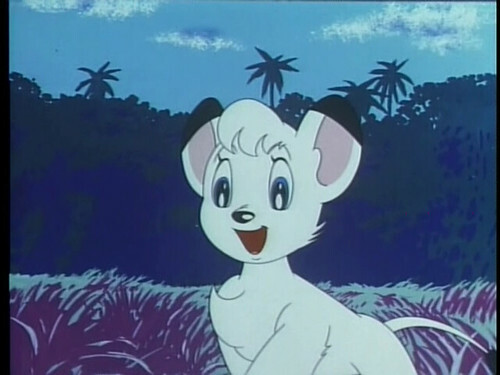 NBC insisted that Leo, now Kimba, remain a cub for the entire series to enhance the series’ appeal to children. 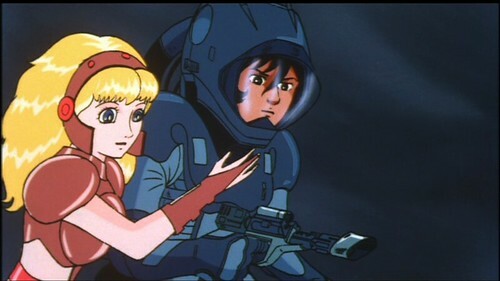 Watching the show today, I am struck by the creative use of color and innovative background art; an evocative full orchestral music score (by Isao Tomita); and some intensely emotional storylines, particularly those in which Kimba encounters sympathetic human characters, who are designed in a more realistic style than the cartoonish human villains. 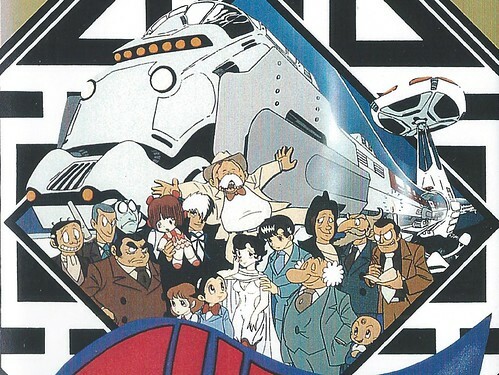 As Tezuka grew more successful, more and more of his works were animated and in 1978, he began creating annual animated specials for television, one of which, “Marine Express” (1979), offered an all-star cast of Tezuka’s characters, in the fanciful sci-fi story of a trans-Pacific underwater train. 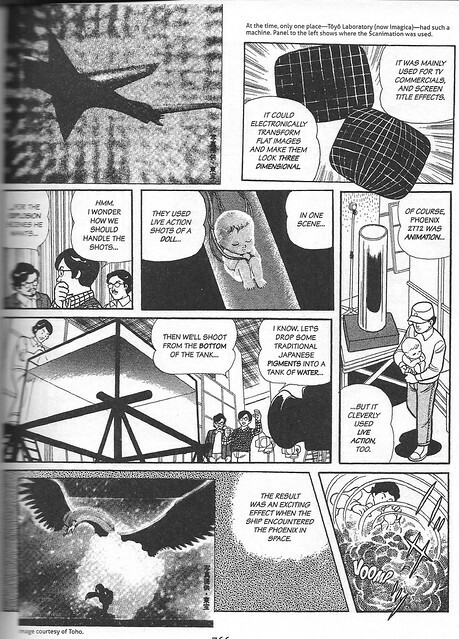 In 1980, Tezuka created a wholly original animated feature entitled PHOENIX 2772, inspired by his long-running manga, “Hi no Tori” (Phoenix), but not based on any previous story in the manga. 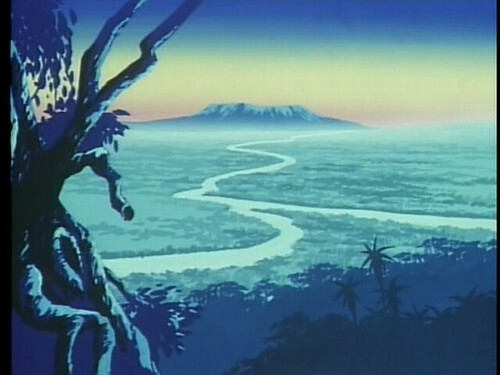 It dealt with a dystopian far future where the ruling government tries to find a way to save the planet from complete environmental destruction. 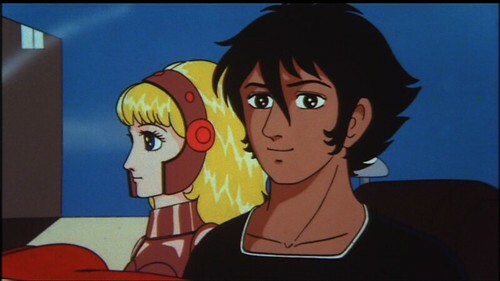 One young space pilot, Godo, after being disgraced and imprisoned, manages to escape in a spaceship and seek out the legendary Phoenix, which can revitalize the earth. 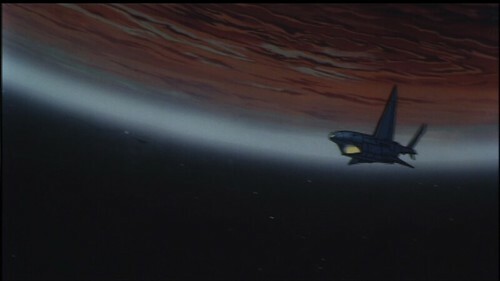 Much attention is paid in the book to the production process of PHOENIX 2772 and the unique effects employed. 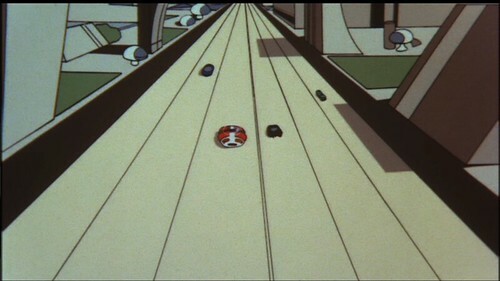 Four pages are devoted to the creation of a remarkable sequence showing the main characters driving for the first time in the city to reach the academy where Godo will pursue advanced training to become a space pilot after having been nurtured since infancy in an insulated automated chamber where all his needs have been met and training conducted by computer, with help from a humanoid robot girl named Olga. 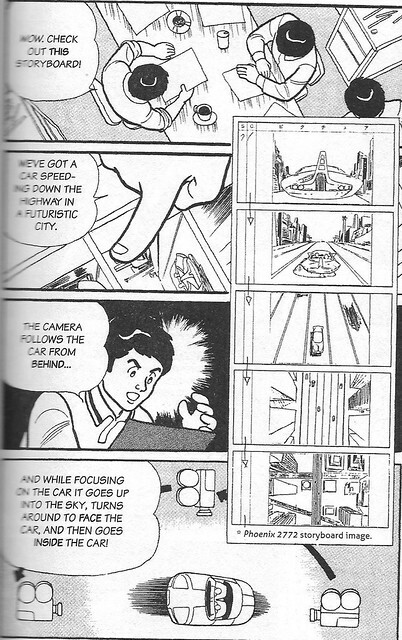 In the sequence, the camera follows the car from behind but then moves up and over the car to film it from an aerial view and then comes down to film it from the front and then lets it pass so we can see close-ups of Godo and Olga as they complete their drive to the academy. 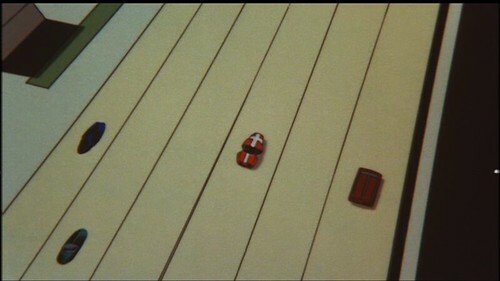 It was quite an intricate sequence and required lots of pre-planning and use of models to storyboard it. 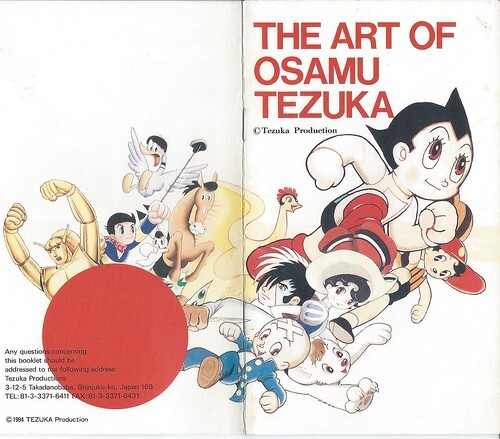 The book also covers the NHK documentary on Tezuka, which aired in 1986, entitled “Osamu Tezuka: The Secret of Creation.” Its only release in the U.S. was as a supplement to the massive coffee table book, The Art of Osamu Tezuka, God of Manga, by Helen McCarthy (Abrams, New York, 2009). 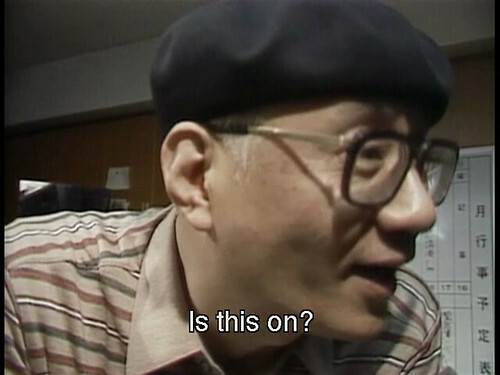 NHK Special The Secret of Creation This is an extremely valuable documentary that attempts to capture the natural self of the “god of manga”! 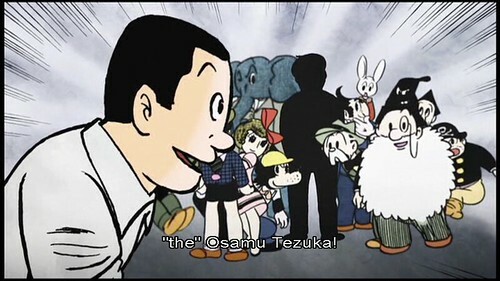 It is a documentary that tries to unearth the creative secret of Tezuka Osamu. 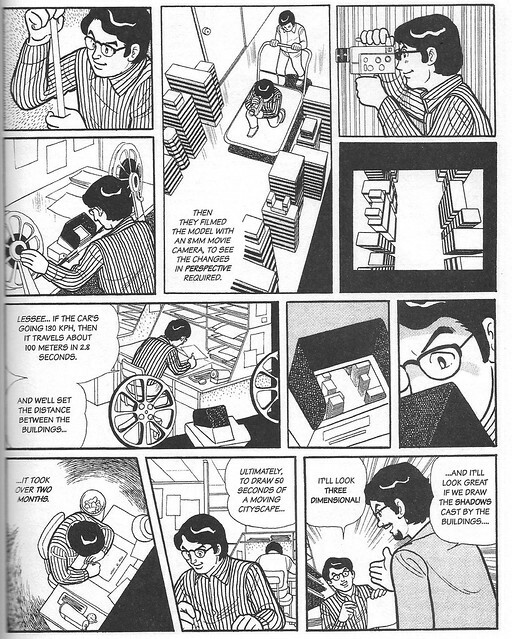 For the first time, remote-control cameras were taken into Tezuka’s workroom located in an apartment building in Tokyo which even his assistants were not allowed to enter. 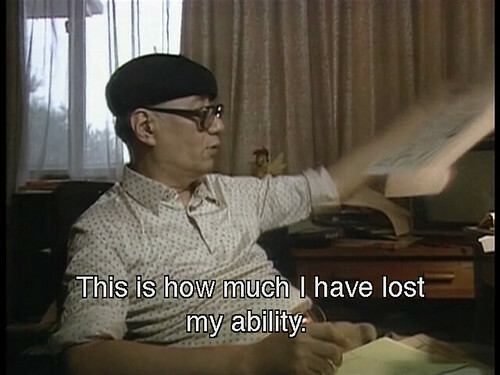 The documentary contains extremely valuable footage showing Tezuka dedicating himself to manga, working in superhuman fashion. 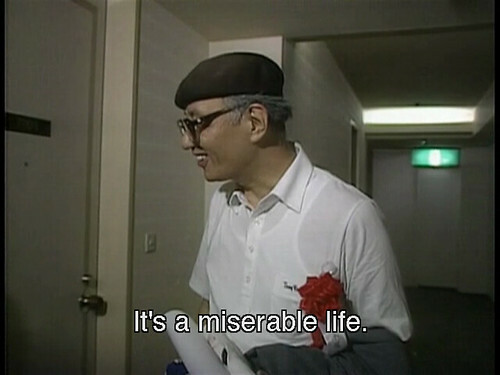 He talks frankly about overcoming artistic slumps, creative distress, inspiration for Adolf, and childhood memories. 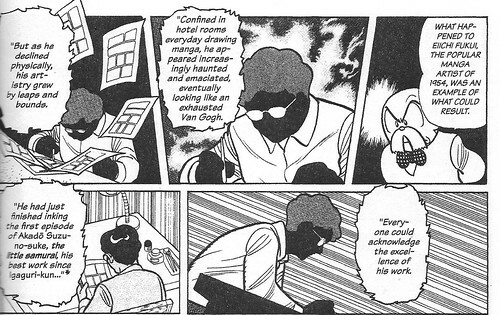 The film shows him struggling to draw manga after going without sleep. 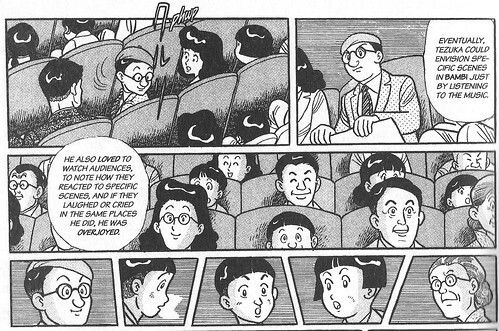 This creative history of the “god of manga” shows his continuing psychological distress. 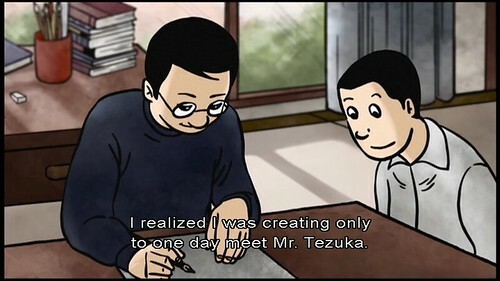 It is a must-see documentary not only for Tezuka fans but also for people working in the animation industry. 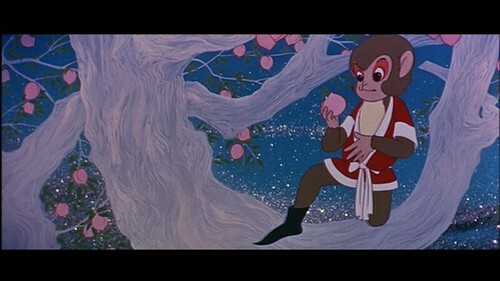 He died roughly three years after the film was shot. It’s obvious that he died of overwork and bad nutrition. He kept up a furious pace for over 40 years. 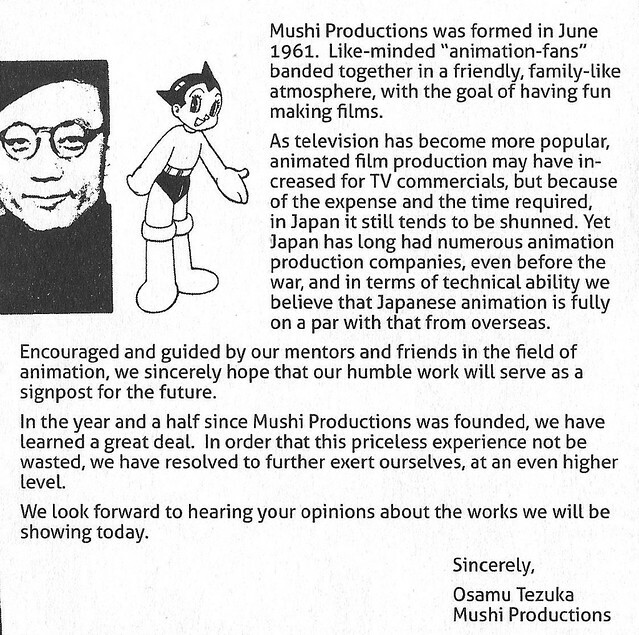 Mushi Productions went bankrupt because the income they got didn’t cover the expenses of production and they got way too ambitious after the success of “Astro Boy.” Their productions were often quite successful, but the expenses always overwhelmed the profits. Which raises another key question, addressed in the book. 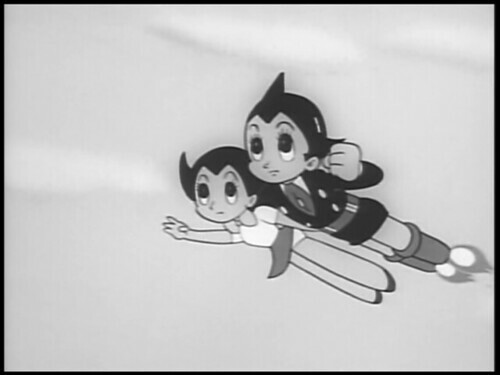 Why did Tezuka offer to make each episode of “Astro Boy” at such a low price? 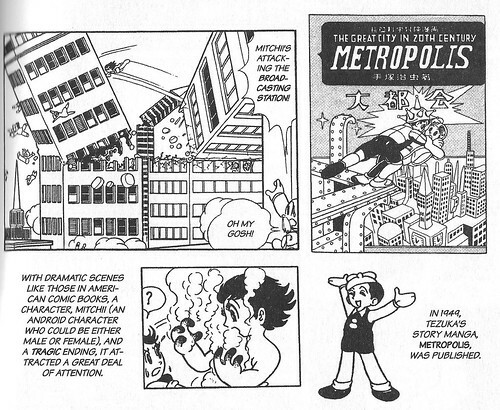 Schodt talks about this in The Astro Boy Essays, in a discussion of how Tezuka tried to come up with a way to make a regular animated series with the small staff and meager resources of his company. 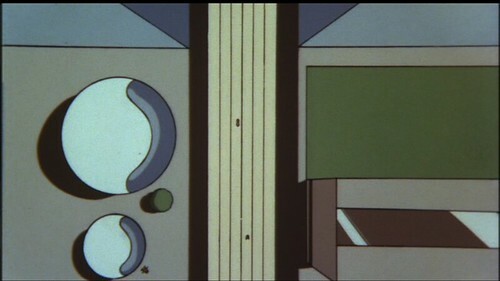 He latched onto the idea of limited animation, using fewer frames for each action and emphasizing the stories, characters and dialogue, rather than the action, with imaginative, but static, visuals, rather than constant movement. 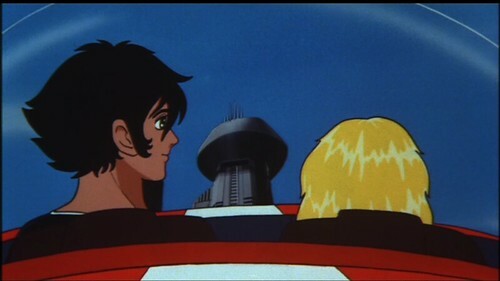 Unfortunately, hoping to make the series more competitive and thinking that it would ward off potential competitors, an over-confident Tezuka agreed in his bid to Fuji TV to adhere to a cost and production schedule that bordered on the inhuman It was a rash act that he would come to regret later.…the staff of Mushi Productions was then forced to work against the clock. 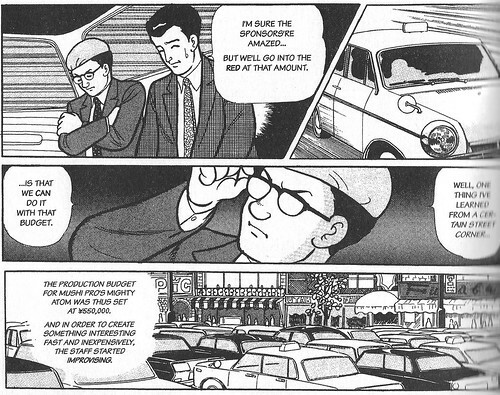 Unlike Walt Disney or later Japanese animation stars such as Hayao Miyazaki, Tezuka was never cut out to be a business or organization manager. 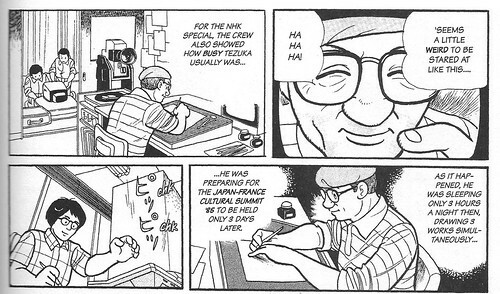 He was first and foremost a storyteller and a manga artist. 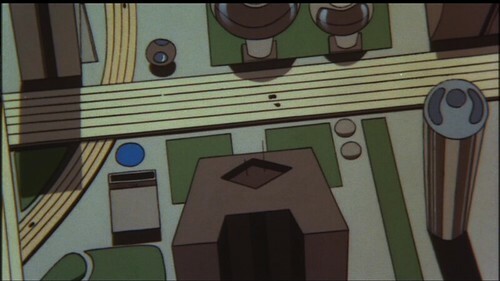 Running a company the size of Mushi Productions…required a large organization, and an organization required delegating authority. And delegating authority meant something he abhorred—losing control over his own creations. 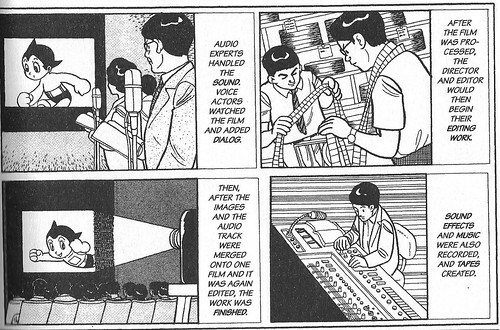 Contrast this with the slower working tempo of anime giant Hayao Miyazaki (MY NEIGHBOR TOTORO, KIKI’S DELIVERY SERVICE, PRINCESS MONONOKE, SPIRITED AWAY), who’s still dabbling in projects at the age of 77, having announced his “retirement” many times over the years only to come back for one more. 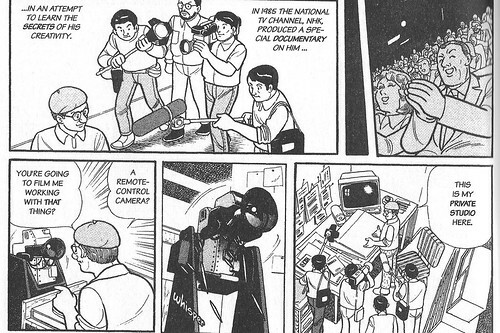 (He’s currently working on a new film.) 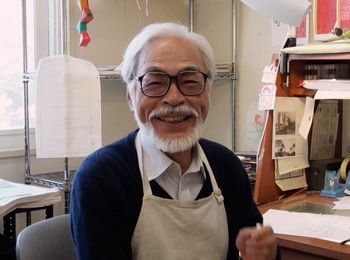 In 40 years, Miyazaki has directed only eleven animated features, and contributed to several others, but has focused his care and attention exclusively on each film he was directing, turning out some of the most universally beloved and acclaimed animated features of the last three decades. 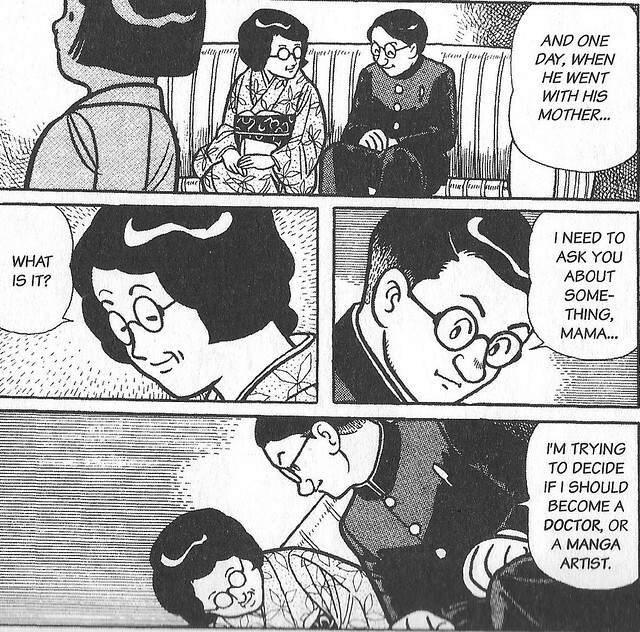 There’s not much in the manga biography about Tezuka’s wife and children or about his personal life in general. It’s quite possible that he simply didn’t have one. 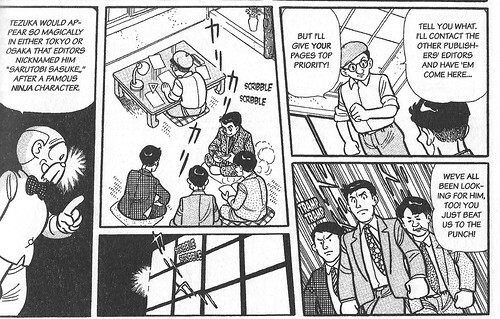 We do see his wife and kids briefly, but not for very long. And while the bio does acknowledge the grueling pace of his work and the toll it took on himself and his staff, it does tend to gloss over the long-term negative effects of such fervor. 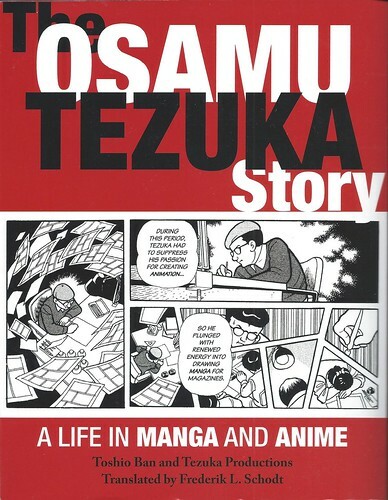 The Story of Osamu Tezuka is a magnificent tome of a book, an illustrated history covering not only the year-by-year life of Tezuka but the development of modern manga and anime. 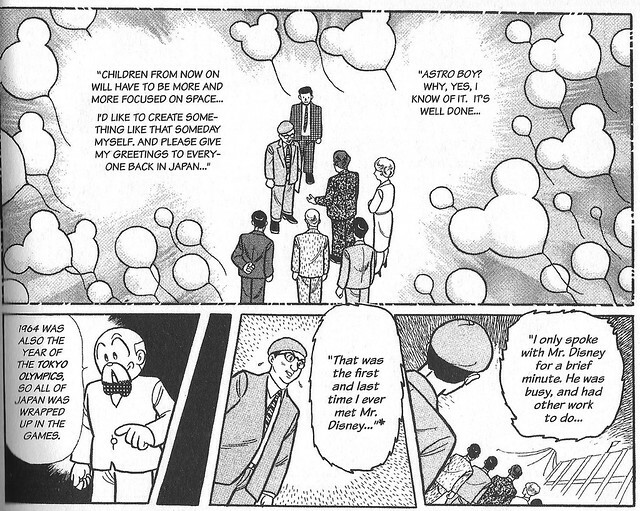 It’s chock-full with points of technical interest, and applies passionate devotion to the telling of Tezuka’s life. 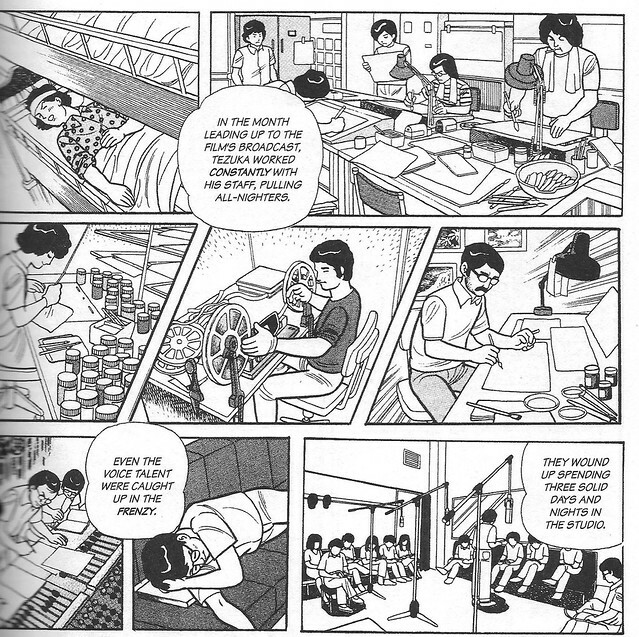 These scenes of overwork and exploitation appear repeatedly, framed as a celebration of creative devotion that’s hard to swallow in this day and age. 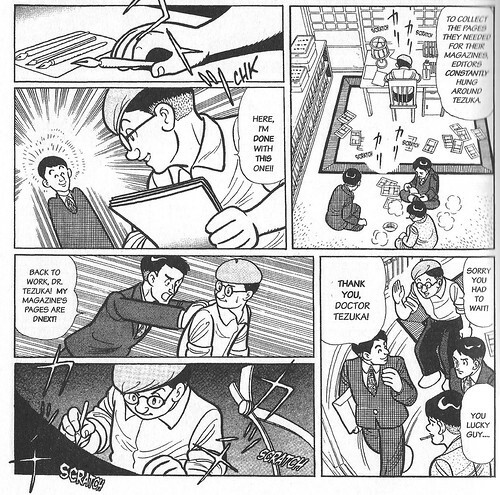 In December 1966 an overworked employee of Tezuka who had devoted himself to the Atom TV show [The Mighty Atom, or Astro Boy] collapsed and died at his desk, and from the way this is presented it’s unclear whether the reader is expected to think this is a wonderful or terrible thing. 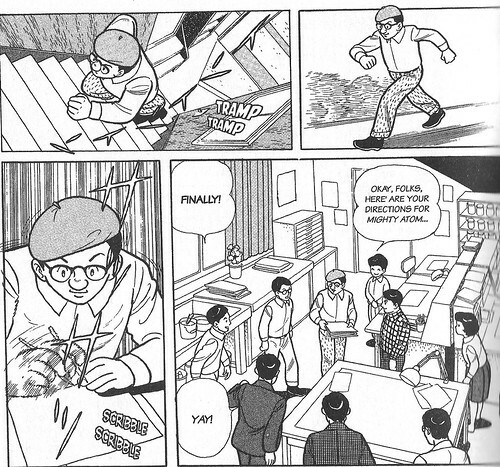 One curious omission from the manga biography is Yoshihiro Tatsumi, a manga artist who considered Tezuka his mentor and went on to develop the gekiga style of realistic, cinematic manga in the 1950s. 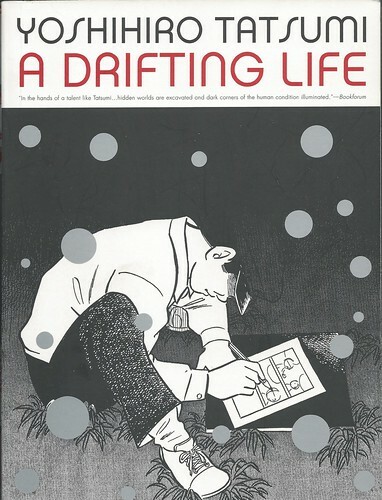 Tatsumi created a manga autobiography called “A Drifting Life,” which I mentioned earlier here and linked my blog post about him. 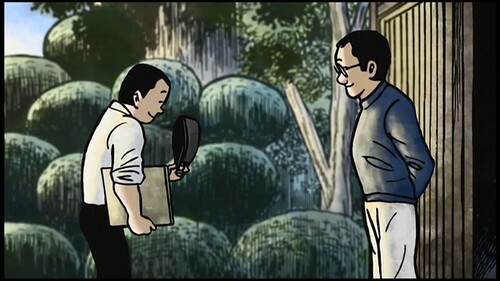 He was also the subject of an animated film, which was part documentary and part dramatization of Tatsumi manga stories. 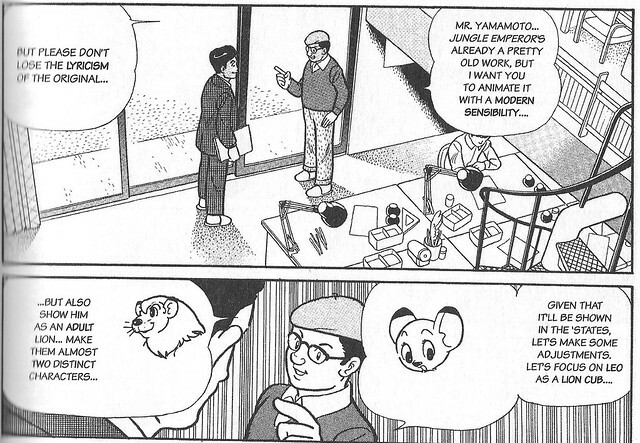 Tatsumi recalls his meetings with Tezuka in both the autobiography and the film. 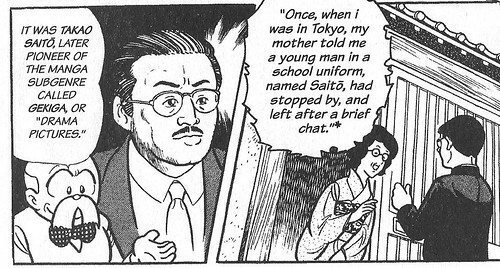 I have no idea why Tatsumi is absent from the Tezuka bio. 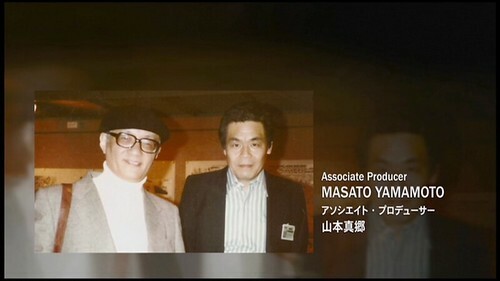 Tatsumi died in 2015. 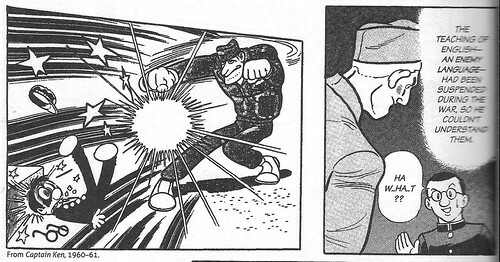 Like Tatsumi’s autobiography, Tezuka’s manga biography is a thick, richly detailed, densely-packed work filled with touchstones of Japanese postwar history and pop culture, as well as those elements of American pop culture that influenced these artists. For me, neither book is an easy read, because there’s so much to savor and I don’t like to process too much in one sitting. 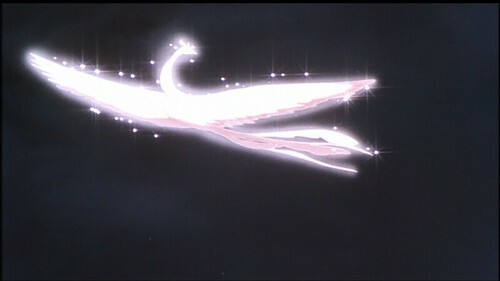 But they were both extremely rewarding. 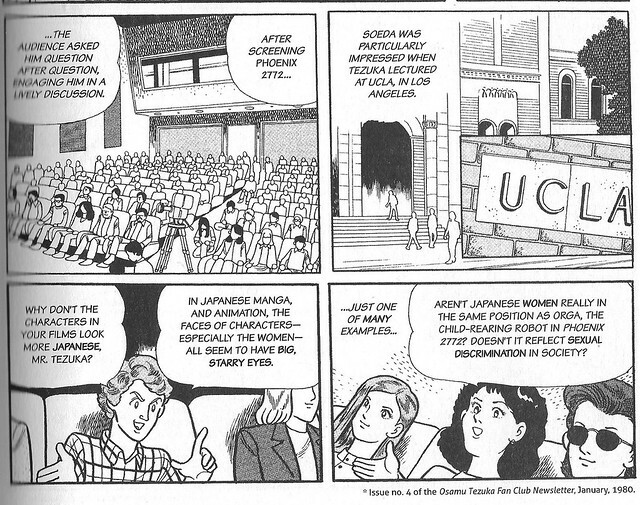 When I taught a course on anime at the City College of New York/CUNY in 2009, I devoted one class to Tezuka. In preparing for it, I realized I had enough material for an entire course on him. 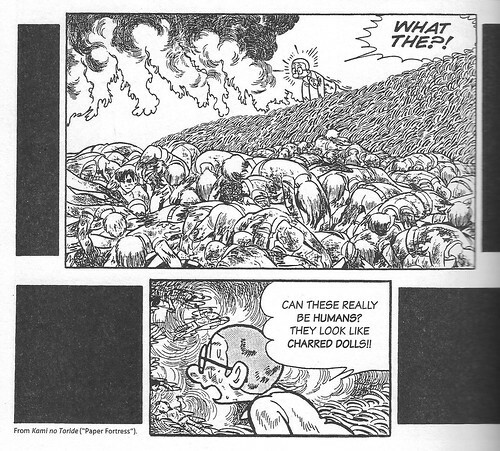 I would like to have offered some critical evaluation of Tezuka’s work here, both on page and on screen, including a discussion of his masterwork, “Hi no Tori” (Phoenix), but I’ll have to save that for a future entry. Plus, I have tons more of his manga to read and anime to watch. 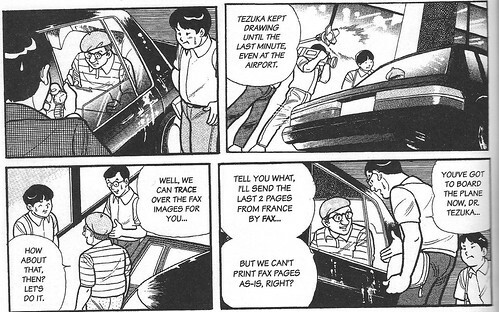 And I’d still like to see a full-fledged critical biography of Tezuka published in English. 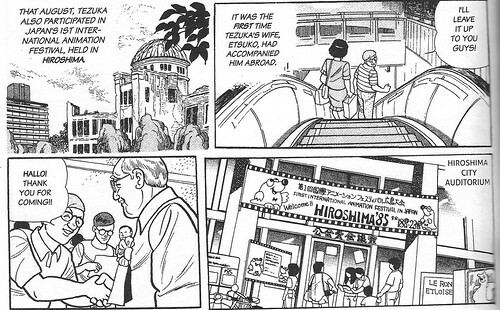 Finally, in the last few years, another series of autobiographical manga has been published in English, a five-volume history of Japan before, during and after the war by an artist, Shigeru Mizuki, who lived through all three periods and actually fought during the war and lived to tell about it, dying in 2015 at the age of 93. I’ll report on that series when I get to it. 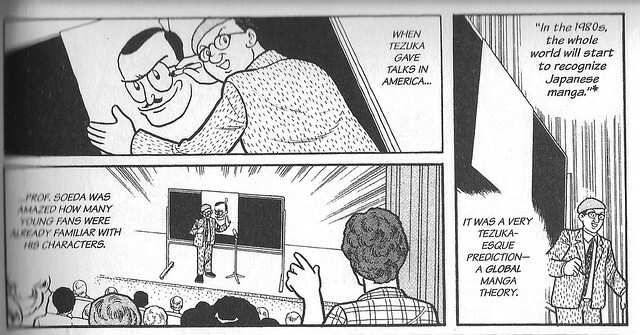 In any event, we won’t forget Tezuka anytime soon.